Safety has been the main driver for maritime communication with focus on voice and distress signalling, supported by narrow-band communication methods. The drivers today are the ship-owners willingness to offer welfare and entertainment to the crew and to gain commercial benefits on passenger vessels. Operational applications also require communication with shore for vessel monitoring, energy efficiency, and making shipping smarter and more cost-efficient. As more and more vessels become “connected” via broadband, concepts such as “Big Data” and the “Internet of Things” will soon become a reality in the maritime business. Ceragon Networks is the world's leader in wireless communication for the Digital Oil Field, with more than 40 years of experience in wireless offshore communications system. 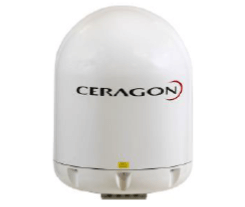 Ceragon’s unique experience with stabilized antenna systems for offshore application has set the standard for wireless infrastructure to moving vessels and platforms. The modern ultra-light design of the PointLink Access enables effective communication to smaller vessels and mobile users. It’s compact light weight design saves valuable deck-space, and with a total weight of approx. 25 kg (50 lb) including data modem, antenna and protective radome, the system is easy to install on the vessel.